While we were exploring the Brew Ridge Trail south of Charlottesville, Va., for a magazine article, we took a day off to bicycle. Lina created one of her trademark custom loops using Google maps and our collection of trusted DeLorme Atlas & Gazetteers. We did a 42-mile loop around rural Nelson County, and the scenery was just gorgeous. Lina mostly kept us in valleys and along rivers, though we did have a few challenging climbs and some long stretches on dirt roads (surprise!). 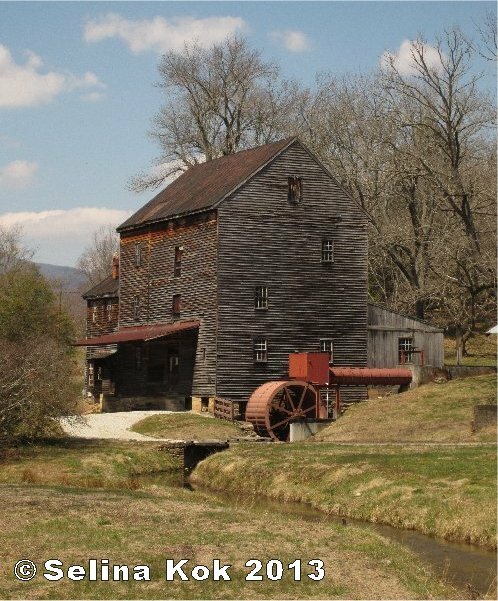 One of the many delightful sights we happened upon was Woodson’s Mill in Lowesville, a village that used to be an important stop along the Virginia Blue Ridge Railway. The building was so impressive that I stopped to take a look, and of course Lina snapped several photos. The gate was locked, so we didn’t poke around. Later, I was delighted to read on the mill’s website that it has been owned by only a small handful of families since its construction in 1794 and is operational! Read the full history here. More info from the website: The late J. Gill Brockenbrough Jr. purchased the property in the early 1980s and started a massive restoration effort there. The mill served as the backdrop to son Will Brockenbrough’s childhood and formed his appreciation for history, architecture, and historic preservation. Will and his wife, Sarah, reopened the mill and now run it. How wonderful! 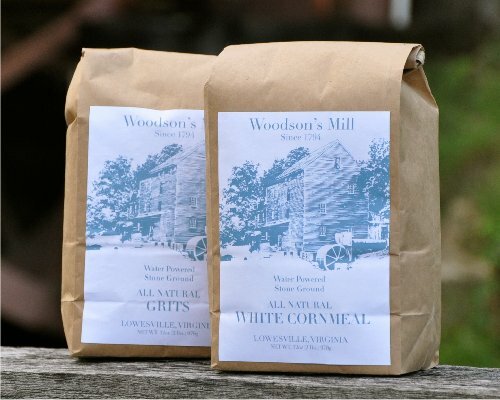 They make all-natural flours and meals in small batches, by hand, with stone-ground grains. All the power for grinding comes from the Piney River’s water, which runs the Mill’s overshot wheel and hand-dressed millstones, making the entire process renewable and sustainable. And now, for the best part: Woodson’s Mill is open May 25 through October 26 on Saturdays from 10 a.m. until 4 p.m. If you can’t go then, contact the owners to see if you can make an appointment for a different time. Or, if you can’t make it to the Mill Store, their products are available online and at regional retailers. What a happy story, and it’s not over yet! This entry was posted on May 1, 2013 at 7:43 pm and is filed under Beer, Bicycling, Family travel, Food, Virginia. You can follow any responses to this entry through the RSS 2.0 feed. You can leave a response, or trackback from your own site.